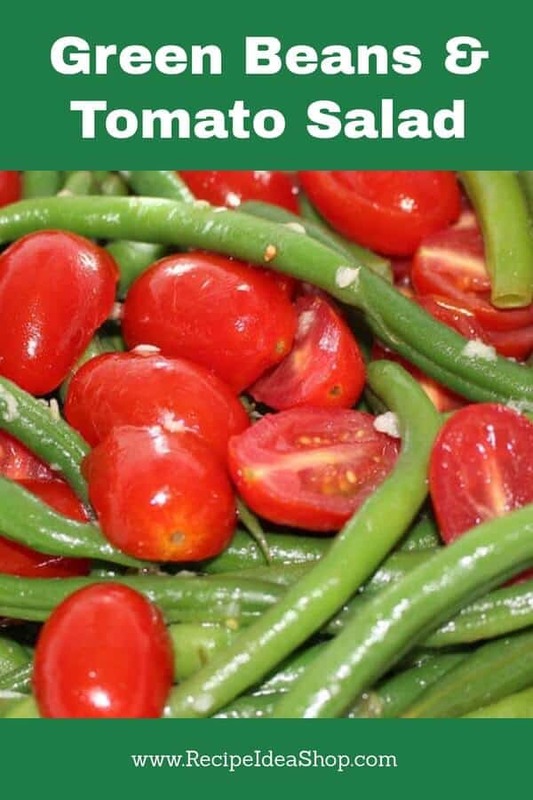 Green Bean Tomato Salad. Deliciously easy. Tomatoes. Green Beans. Garlic. Vinaigrette. Yum! Green Bean Tomato Salad. Tomatoes. Green Beans. Garlic. Vinaigrette. What’s not to love? Hi. It’s Lois at Recipe Idea Shop, telling you about one of my favorite salads, Green Bean Tomato Salad. This is the perfect summer or anytime salad. It is very flavorful and eye-catching. 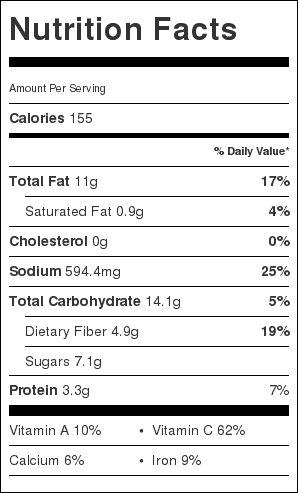 It’s best made with fresh green beans, but you could substitute cooked and cooled, frozen green beans. We are so lucky in the United States. We have fresh vegetables available year round. You’ll want a vegetable steamer and a beautiful serving bowl for this recipe. Yamde 2 Piece Stainless Steel Stack and Steam Pot Set – and Lid,Steamer Saucepot double boiler. Buy this vegetable steamer on Amazon. Medium Serving Bowl Hand-Thrown Hand-Glazed in Ireland. Measures 10” Diameter 3.5″ Height with Traditional Celtic Spiral Motif. Buy this beautiful bowl on Amazon. You'll find crunchy, packed with flavor goodness in this Green Bean Tomato Salad. Steam the green beans until they are crisp tender and still bright green. Pour them into a bowl and set them aside to cool. 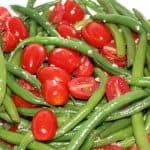 Cut the cherry tomatoes in half and toss them in with the green beans. In a small bowl, combine the lemon juice, oil, salt and garlic for the vinaigrette dressing. 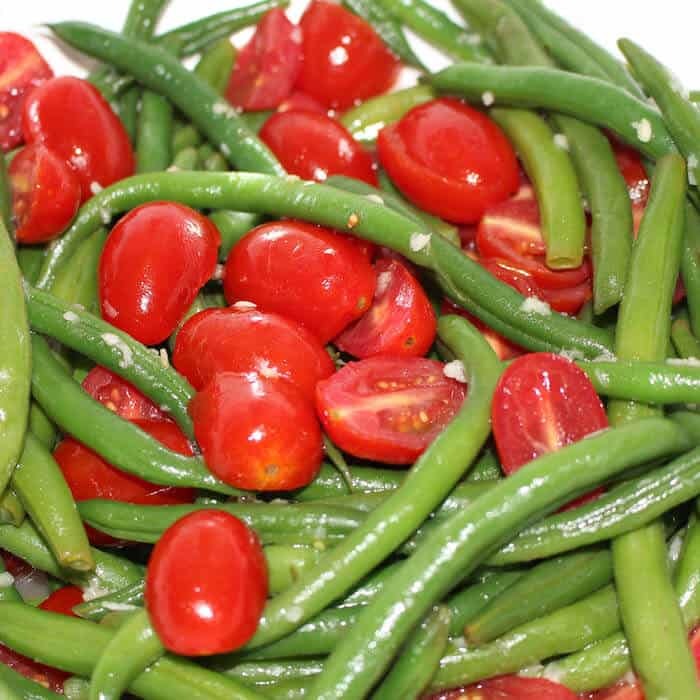 When the beans are cool, toss the tomatoes and green beans with the dressing.